I just found myself disagreeing with me. I reread a blog post that I had written a week or two ago that was posted on the Shopzilla blog, and noticed that I had written that “metadata is as important as the primary data (well, close enough that the difference doesn’t really matter)”. That was wrong. There is actually no difference in importance between the two. This is because importance is actually binary: either you have to do something, or you don’t. I’ve found myself using more fine-grained definitions of relative importance of things before, and I thought it was a good thing to do. Having different severity levels for bugs, for instance, felt right: there seemed to be a difference between a blocker, a normal-level one and a cosmetic bug. Over time, I’ve come to realise that there are only two classes of bugs: those you can live with and those you can’t. The latter must be fixed, the former don’t have to be. And the corollary of that is that it’s always going to be more important to add another feature than to fix a bug that you can live with, so the bugs you don’t have to fix should just be put into some bucket where they can live undisturbed forever. I remember some years ago, when Microsoft released a Windows version that had something like 35,000 known bugs in it, and how some people were upset about that. “How can they release something that has so many bugs?” I think that is (or at least can be) a perfectly OK thing to do, it just means that you’ve tested your software thoroughly and know the quality status of it. The remaining bugs are things you’ve decided not to fix. Getting back to the topic of priority again: that is another thing, it’s not the same as importance. I think of it as a two-dimensional thing, where importance is one axis and urgency is the other. Say you have five things to do, A through E. As soon as you get E done, you’ll increase your revenue by around 3%, but before you can do E, you need to do D. A is a bug that you really want to fix, B is a document that you ought to write according to the company standard process, but that nobody will ever read, and C is a bug that you in all honesty don’t need to fix even if it annoys you. 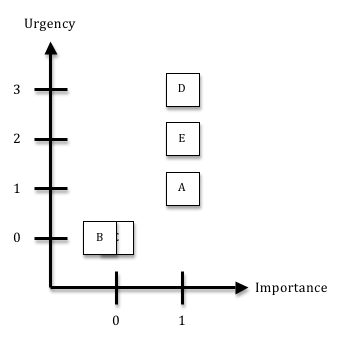 This diagram shows how I would do prioritisation in that case. The unimportant things get an urgency of zero. We don’t need to do them, so let’s just not do them (although the best thing to do about that document is to change the company process that requires doing work that is wasteful). The urgency values assigned to the important things are based on their intrinsic value and on dependencies between them. If you have to do it, just do it – and finish it. Really. All the way. If you don’t have to do it, there’s no excuse for doing it. So don’t even think about it – put it on a pile of stuff that you can forget about and make sure it doesn’t worry you. This entry was posted on January 29, 2010, 17:48 and is filed under Software Development. You can follow any responses to this entry through RSS 2.0. You can leave a response, or trackback from your own site. I wonder if this comment wasn’t meant to appear on https://pettermahlen.com/2010/05/19/gradual-refactoring/ ? Either way, I really liked the videoblog. Especially his distinction between technical debt due to poor engineering, which isn’t acceptable, and debt that comes from a gradually increased understanding of the problem domain, which is natural.